Using RFID and GPS technology to covertly and overtly track, monitor and recover military assets from supply chain to field deployment, saving time and money, with greater efficiency and security. Does your Military base rely on manual or outmoded technical processes to track and monitor high value assets and mission-critical resources such as vehicles, key personnel, equipment and medical supplies? The only way to achieve the precision, efficiency and cost-effectiveness that are critical to the success of Military operations, is to deploy a highly automated, real-time asset tracking and maintenance solution that gives you total visibility and control. 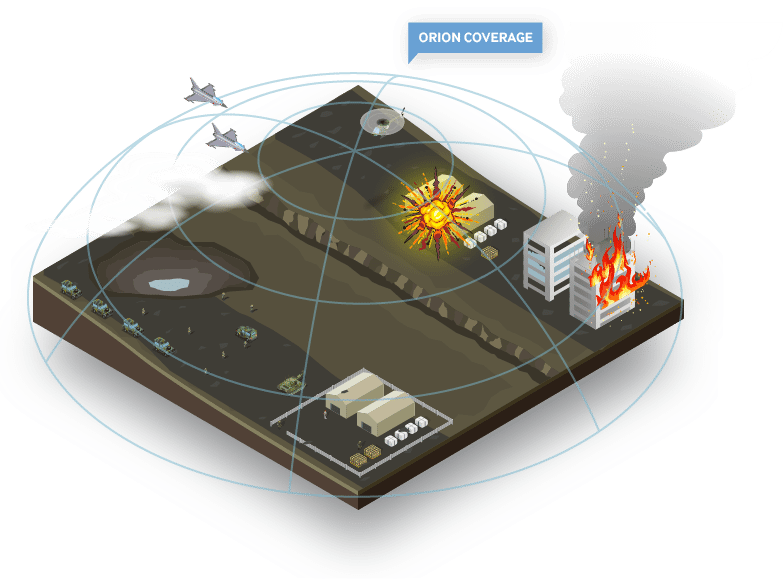 NFC Group’s Orion Data Network Solutions for the Military, including our B360 Asset Tracker, are compatible with mobile devices, Bar Coding, UID Codes and a variety of RFID Technologies. These solutions enable fuel sensing, generator, supply chain and inventory management; Military personnel security and protection; high value freight, vehicle and document monitoring and asset theft and damage prevention for the Army, Navy and Air Force. In recent years, there has been a spotlight on internal operations in the Military. With regard to the US Military, for example, Reuters released a report a couple of years ago showing that manual asset tracking processes, prone to human error, resulted in the Military spending its budget on new supplies that were not needed and on storing old supplies that were out of date and ready for disposal. In 2014, ABC news also reported that inefficient asset tracking, monitoring and recovery resulted in 15,600 pieces of missing equipment valued at approximately $419.5 million. These issues not only adversely affect the Defence budget; the repercussions can be far more serious if these inefficiencies lead to equipment shortages that negatively impact training, special operations or emergency response. It’s important that Military units take the same highly organised and efficient approach to internal operations as they do to defending their country. A successful solution needs to seamlessly link people, vehicles, equipment, vessels and medical supplies even in the most remote locations outside of cellular range. Individual Military bases are accountable to their government for the property that’s assigned to them. When asset tracking data is entered manually into spreadsheets there is a high risk of costly errors and it’s impossible to enter the data in real time. This means the available information is never really up to date and you cannot be sure where your assets are and what condition they are in. It’s impossible to accurately deploy your assets, calculate depreciation or predict maintenance schedules. This is information that needs to be highly accurate and available to all relevant personnel, not just a couple of people who are responsible for inventory and data entry. Automating your Military asset tracking eliminates the risk of human error and the potential for fraudulent data to be entered. NFC Group’s Orion Data Network asset tracking solutions for the Military, such as the Military grade B360 high value GPS Asset Tracker, enables real time tracking and data feedback with highly customisable reporting to reduce time and costs, and improve efficiency and accuracy. At NFC we understand that, due to the sheer scale of internal operations, the Military has unique asset tracking requirements. Our first-to-market Orion solutions combine 3 highly effective types of technology: a satellite tracking device; a GSM/GPS device with an international roaming SIM; and a low-cost Orion tag that attaches to each asset. Orion enables the Military to reliably track remote assets and personnel improve supply chain visibility, prevent domestic and international cargo theft and damage; manage fuel sensing and generators; predict maintenance schedules and track and communicate with key personnel in dangerous and remote locations. Orion Military asset tracking, monitoring and recovery solutions reduce costs, save time and increase performance, precision and efficiency. For more details on the features and benefits of the Orion Data Network for the Military visit this page.